Ms. Celiac Says...: Get Your Super Healthy Iced Tea Today! 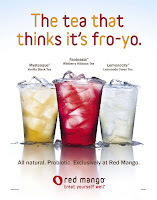 Today, July 27, Red Mango introduces the first Probiotic Iced Tea. It is the first retailer to offer made-to-order iced teas fortified with probiotics. These drinks are gluten free and are also low calorie, fat free, and sweetened with natural cane sugar. They contain no preservatives or artificial ingredients. In addition to the new probiotic enhanced iced tea, Red Mango's Original, Pomegranate by POM Wonderful and Tangomonium authentic frozen yogurt sold throughout New York will now include GanedenBC30. By September, all Red Mango stores will have frozen yogurt with GanedenBC30.